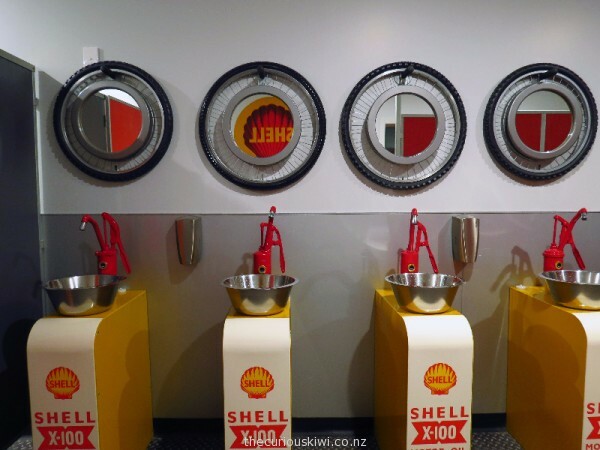 Petrolheads will appreciate the men’s room – part of a fuel pump opens the door, Shell oil pumps dispense water, and a one way mirror into a showroom full of vehicles makes it a loo with a view. (More about the view – Bill Richardson Transport World). 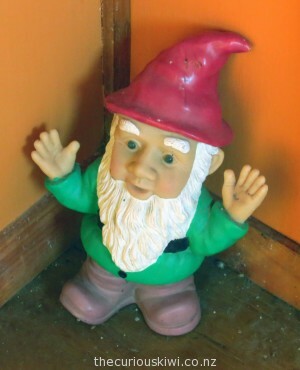 It’s all about the sound in the thunder box at Lost Gypsy Gallery – blame it on the gnome. They get down to business in the toilets at Discovery Centre in Otago Museum and tell you what happens when you flush and where it all ends up. 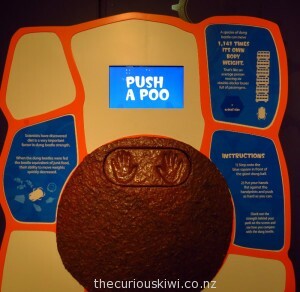 There’s also some toilet humour kids are sure to appreciate – they can ‘Push A Poo’, a plastic poo that is. Kids can see how strong they are compared to a dung beetle that can push 1,141 times its body weight, the equivalent of a person moving 6 double decker buses with passengers onboard! Guys can’t be camera shy in the men’s room at Jervois Steak House. 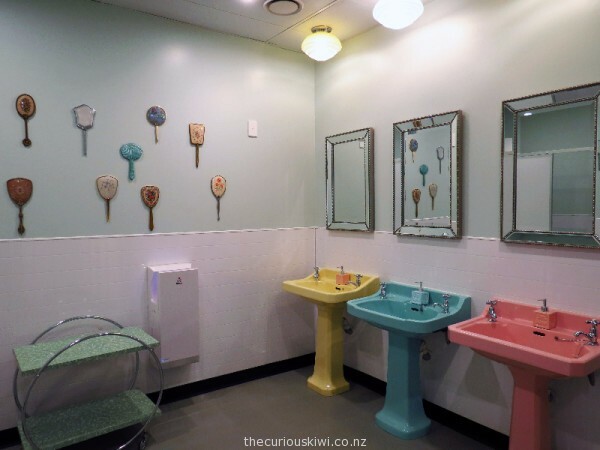 It’s been a couple of years since we camped at Creeksyde Holiday Park but they have some of the most unusual, and relaxing bathrooms in Queenstown. 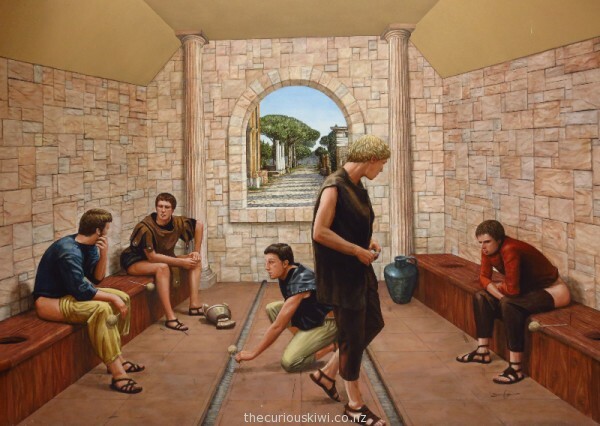 They used to ‘go’ together in ancient Rome, this communal Roman latrine mural is near the restrooms at Puzzling World. You can take a seat and become part of the scene – with your pants on! Wunderbar in Lyttelton surely has the most elusive toilets in New Zealand. It took me a while to find them, I give women a clue in the post Curious or Creepy? 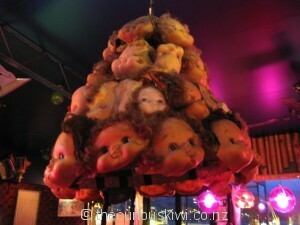 Wunderbar in Lyttelton. The people of Christchurch have had to put up with a lot over the last few years, for some that has included building and using long drops in the backyard. A website was created to display imaginative Long Drops, and to provide some humour during tough times. 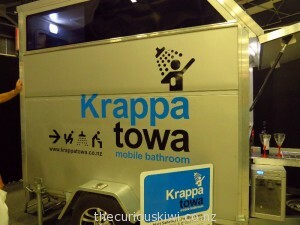 The Christchurch earthquakes were the impetus for a business selling another type of mobile bathroom, one with a name that says it all – KrappaTowa. The KrappaTowa was initially used by designer Matt Sandrey and his wife while camping at remote sites. 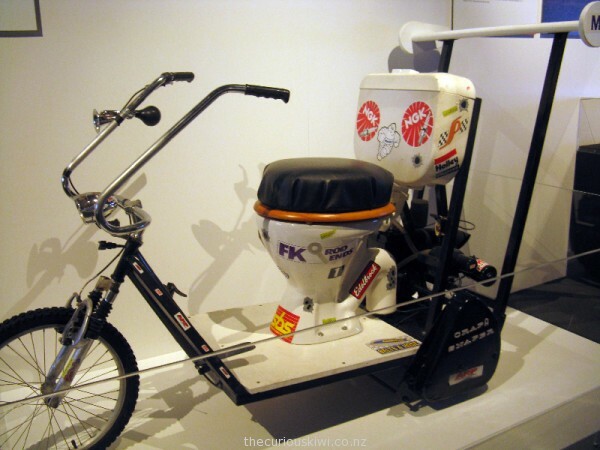 During the earthquakes the KrappaTowa came in handy and was used by friends and neighbours who encouraged Matt to turn it into a business. LowaToa for wheelchair users has since been developed. 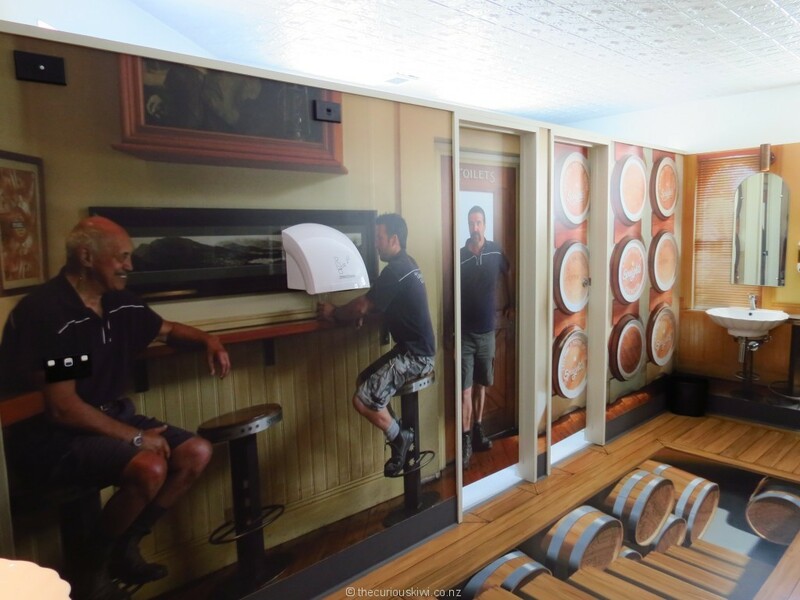 Dux Central opened in Christchurch in September 2015, along with a new Dux venue came new look toilets, including interactive urinals for men. Women don’t get to play games in the loo but along with the men they get explicit images on the toilet doors. See the urinals and the toilet doors via this short clip on TVNZ. The sign says it all at Jester House Cafe in Tasman, Nelson – In Compost We Trust. 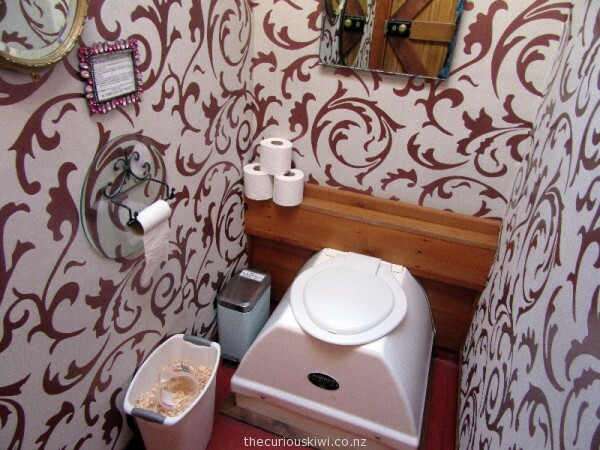 That’s the low down on some of the unusual toilets we’ve found in New Zealand. The inspiration for these posts came from being disappointed at the state of a few toilets, pet hate – no hot water. We’ve found that the love shown to a venue can often stop at the toilet door, but instead of focussing on the awful, I chose to focus on the unusual. We all have to ‘go’ so thanks to those who make it a pleasant experience, if you’re a business owner your toilet may even effect your bottom line because if you have a loathsome loo you may find your customers choose to go elsewhere. 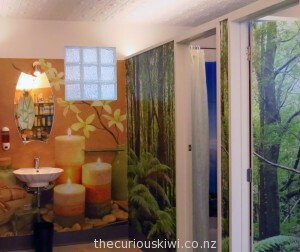 This entry was posted in Southland, Unusual New Zealand and tagged unusual toilets by thecuriouskiwi. Bookmark the permalink.